Warm hospitality with all the comforts of home. 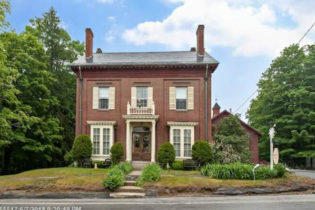 This stately 1859 Greek Revival is a fully operating B&B built by Jeremiah Mason, a prominent 19th-century banker, and Maine legislator. This remarkable Inn has 10 guest rooms with private bathrooms in the main house, Innkeepers quarters, and 2 apartments in the carriage house. A third apartment in carriage house is possible. Nestled within southwestern Maine’s hills and lakes, loaded with charm including floor to ceiling windows, chandeliers, decorative fireplaces, wood floors and tin ceilings, this special property has many possibilities. It is within walking distance to town, and is less than 1-hour drive to ski areas, beaches, state parks, Portland and North Conway NH. The carriage house now has 3 legal apartments that can be rented year round.